Hey Tampa, Lisa here with an announcement about The Florida Aquarium. Wednesday, June 8th is World Oceans Day. 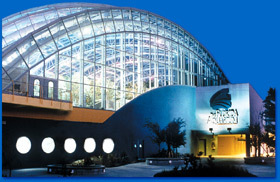 To celebrate, The Florida Aquarium is hosting special education programs on June 4, 5 and 8th. There will be activity stations throughout the Aquarium, learning games about responsible fishing and how coral reefs are formed, a text message scavenger hunt as well as, a Dr. Seuss scavenger hunt in the galleries. The Aquarium is one of more than 1,200 aquariums, zoos, museums, and conservation organizations coming together to get the word out about conserving our worlds oceans. The worldwide theme this year is "Youth: the Next Wave for Change," giving the youth a special focus on teaching them how to conserve our world&apos;s oceans. World Oceans Day is held on June 8th each year. So come on out and help support a great cause. That&apos;s all I have for now, but check in later for other Things To Do In Tampa Bay!